What i really object to is going somewhere for a casual meal and it ending up to be the most fussy affair. I went somewhere recently looking forward to an easy lunch and ended up with a 4 course meal. It does not aid relaxation! So, we had a visitor last night and i made a simple pie. A minced beef and onion filling and, infact, some ready made shortcrust pastry. 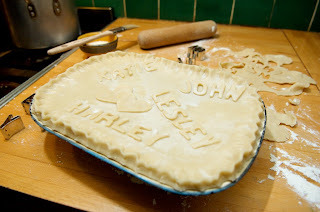 To make it a little out of the pordinary, i just cut out letters and put all of our names on the pie. Harley just loved it and thought it was wizard. It had a wow factor, with a tiny cost and simplicity too. Unless a formal dinner party is on the menu, keep things minimal and simple. If you are entertaining, trying something different can be worrying and stressful -infact that applies to formal entertaining too - so stick to what you know. And it does not have to be a restaurant dish. The art of simple cooking should be revived, excluding chilli and olive oil! Revert to what you ate with your granny! It nay be revolutionary.